Bicycle technology advances at a staggering pace, which is generally good for everyone. And who knew better than Einstein that "Life is like riding a bicycle. To keep your balance you must keep moving." What is true in life is true for the bicycle as well. Consider the Evolution hub. To understand the motivations for redesigning the bicycle hub, it is good to go to fundamentals. Asking straightforward questions like "What forces act on a hub, and how important is each?" Let's consider these forces, and what the bicycle wheel is in its simplest form. Then, once we get these digested and consider redesigning the hub, we need to ask, "is it really worth it? Do we really need to have yet another change and its associated difficulties?" My answer is a resounding yes. I wouldn't have moved forward with the Evolution hub if I didn't firmly believe I could make a significant change for the better. And spent all the time and effort to submit a patent. Man that was a lot of work. Let me walk you through my thinking and see if you agree. What is a bicycle wheel in its simplest form? Answer: It is an isosceles triangle rotated around its base. The vertices at the end of the base are at the frame attachment (dropouts). The topmost vertex is at the rim center. 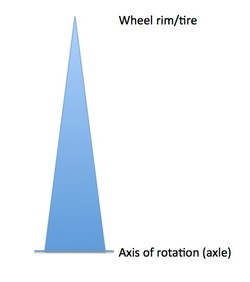 The base of the isosceles triangle is the Axis of rotation of the wheel. This coincides with the wheel axle. 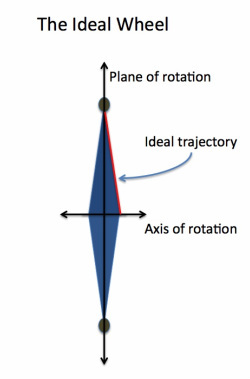 Mathematically, the axis of rotation is parallel to the normal vector of the plane of rotation. My apologies for a bit of math, but it is necessary so we can have clear lexicon for moving on to detailed discussions. Lastly, let me introduce one more term: Ideal trajectory. This is a line along our wheel that we'd like to keep all forces within. It represents a direct connection from the frame attachment to the rim, and is the simplest route from point A to point B. Ideally we don't leave this trajectory. So that's it. Rotate our little triangle around its base and we have the wheel. Done deal. But the devil is in the detail as the saying goes, lets move on to see what happens when we consider how we use this little feller. I define Suspension Forces as the combined weight of the bike and rider that need "suspended" above the ground. These are the primary forces supported by a hub, and the only forces supported by a typical front road hub. These forces enter the wheel at the frame attachment, and leave at the rim. So it's easy to see that we'd like these forces to be confined to the Ideal trajectory. Unfortunately when dealing with a drive hub with a disc brake we need to make some compromises. We need to pull the left spokes inward towards the plane of rotation to attach a disc rotor and to clear the brake caliper. Similarly we need to pull the right spokes inward to clear a gear cluster. When talking about the suspension forces, the primary hub components we're concerned about are the wheel bearings. They bear the entirety of the suspension loads. We want them widely placed. Yea, kind of like bottom bracket bearings... they're widely placed, right? Especially since we've moved to external bottom brackets, and everyone talks about what a cool step forward that is! So where, exactly, are the wheel bearings in a modern hub? Well, let's have a look at a DT-240. This is a wonderful piece of Swiss precision. Where are its wheel bearings? They have to be near the ideal placement, right? Think again. Here is a cut-away DT-240. 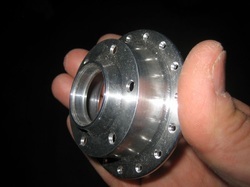 Four bearings are visible. Which ones are the wheel bearings? The must be the two outermost bearings, right? 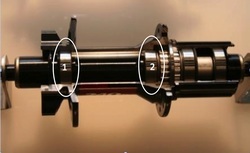 The two bearings on the right are carrier bearings to support the cassette body. More on this below. They don't help a bit with the suspension loads. Unfortunately this picture represents the general state of modern cassette hubs. Wheel bearings are narrowly set and far from our Ideal trajectory. So what? Well, it forces the axle to carry a substantial load inward, necessitating a heavy axle. It also forces the hub shell to be small and thick. Simply put: it just ain't right. I want my wheel bearings to be widely set, and the suspension loads to be carried as closely to the Ideal trajectory as possible. I do this by eliminating the cassette body and making the drive system external to the hub body (more on this in the next section). Place the wheel bearings as wide as practical and pass the suspension forces through an approximation of the Ideal trajectory. The loads transfer from the wheel bearings to the structural hub shell as widely as possible, and the hub shell in turn transfers to the spokes as widely as possible too. We have to bring the hub flanges inward enough to clear the brake and the gear cluster, but are free to make them pretty big to get back near our Ideal trajectory. And hey, if we're going to make them a larger diameter, maybe we can make them out of carbon! These are the forces that propel the bicycle, and enter the system from the rider through the chain. They then pass though the cog to the drive system and finally through the hub shell to the spokes. Here too we'd like to pass these forces as simply and directly as possible from the chain to spokes. Unfortunately modern designs deviate far from the ideal trajectory, and the common cassette interface is the cause. What is an interesting side note here is that I've found a pretty common misconception in the industry that the cassette carrier bearings help with the suspension loads. Many people even think Shimano has a patent on just that. If so, then that patent examiner needs fired. 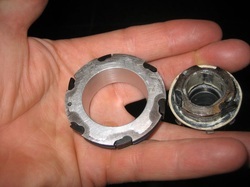 These carrier bearings support only the drive cluster and do nothing to support the rider. Using a standard cassette body interface dictates a small (1 3/8", 35mm) diameter interface as an integral component of the drive system. Most hubs further reduce this diameter when building the drive transfer system which is typically some type of tooth/pawl system. These drive transfers are inboard of the cassette body, taking the propulsion forces even further from our ideal trajectory. When it's all said-and-done, most modern wheels transmit the drive forces through a system at almost the wheel center! This is just about as far from ideal as we can get. 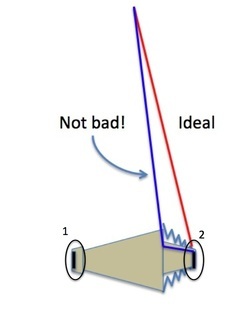 Wouldn't it be better to try to transmit the drive forces at a larger diameter (with the associated reduced rotational moments) at a point nearer the ideal trajectory? I think so. With the evolution hub I have a drive system that transfers the drive forces at about a 2.25" (57mm) diameter as far out on the axle as is possible. This keeps the forces close to the ideal triangle, allowing us to lighten the axle, eliminate the cassette body, and strengthen the system. Reliability and simplicity go up too. Feels right to me. Think pedaling out of a cross race corner. Trying to clean that step on your favorite tech mtb climb. Sprinting out of a crit corner. Every little bit of engagement advantage is felt in these crux situations. To put it into a more concrete example, think with me for a minute about trying to clean that step on your mtb. Right when you least want to: at the top of the hill when your HR is through the roof. You've tried and tried to clean it, but even with your best effort it's eluded you. Here's the scenario: You're in 1st gear. say a 26-36 (modern 2x9). That's a mechanical advantage of about 1.38. You're using your trusty DT-240 hub which engages 18 times per rev (20 degree). You happen to backpedal to get the crank in just the right position as you get to the step. As you pedal forward you want instant engagement, but alas your 175mm crank has to travel almost 3 1/2 inches before you engage the hub. Crap, just smacked the pedal and had to dab. Had you been using an Evolution hub you would have engaged in less than 1/2". Ten times faster than a DT-240. You would have cleaned the step. And maintained your gap in the cross race. And won the crit. Yes, engagement is important. The advantages of the Evolution drive system are the heart of my work: Faster engagement, more reliable, simpler. All while allowing the wheel bearings to be wide set for a stable wheel. Seems a bit silly to move to a 142mm rear norm when we still have so much we can improve with the current 130/135mm rear wheel width. 135mm dropouts, but the wheel bearings are only 50mm apart. Again, that just ain't right. This third type of hub input force only exists on hubs with disc brakes. (BTW, I'm a big believer in disc brakes, and believe they should be present on all bike types, and in a few short years will be.) Here again we want to transmit these forces with as simple and direct an approach as possible, and transmit the loads close to the ideal triangle. A simple brake flange that attaches the disc rotor to the spoke attachment in nearly a direct line is optimal. This is the approach I use in the Evolution hub. In the future I can see taking the 6 bolt pattern to an even larger diameter, we have plenty of room to do this and still clear modern calipers. This would be part of a truly integrated system. Suspension Forces. Propulsion Forces. Braking Forces. Handle all three of these as simply and directly as possible and stay as near to the ideal trajectory as possible. Make it reliable. Acting on these concepts are what created the Evolution hub. Less weight. More reliable. Stronger. Easy to make. Sounds too good to be true. And this is if we stick to the current design constraints. But once we let go of these restraints a whole new world emerges. Time for the bicycle hub to catch up with the other exciting cycling technological advancements. That time is now, the Evolution Hub is here. So, if you follow my rational, and maybe even agree with it, there are some obvious implications and complications associated with adopting my design. First and most obvious is the elimination of the cassette body. I'm an old feller, and I remember distinctly when Shimano introduced it in the mid 1980s. We all had some heartburn with it, and for me it was the fact that these new cassette hubs were heavier than my beloved Campy record hubs. And that I needed to start using gear cassettes instead of freewheels. In the end the change wasn't so bad and actually a step forward. 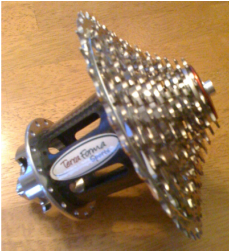 The internals on these hubs were better than most of the freewheel drive systems. That was over 25 years ago and it's time to rethink the cassette interface. It mandates poor transmission of drive forces and makes our hubs heavier and less reliable. 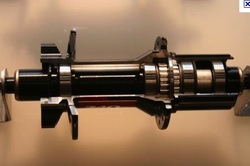 With the elimination of the cassette body we'll need a new standard for the gear cluster interface. This can be attacked with a system solution much like we're doing with modern BBs and cranks. Use of SRAM GXP cranks means using GXP bottom brackets. Using Campy cranks means using Campy bottom brackets. What's so different about using company A's gear cluster with company A's hubs? Eventually everyone might decide on a new interchangable interface. It'd be cool if that happened. Everything else remains the same. No change to the disc interface (for now) an no change to the spoke interface. Use whatever type of spoke head you want, you can still get the benefits of the Evolution hub. The other option is to get an integrated wheel. Kind of like we've got with cranks and BBs. If you get an Evolution hub, you receive the brake disc and gear cluster along with it in an integrated system. Lighter, simpler, better. Maybe some interchangeability among brands, like there is right now between FSA and Shimano external bottom brackets. Or maybe something more proprietary like Campagnolo. I'm not breaking any new ground here, only applying it to a new component. I've already spent a good deal of my life over the last few years working on this. I'll keep doing this. I believe in the concepts and the benefits that the Evolution hub will bring. It's worth it. I love bicycling too much to just let this go. If I gave you a drive hub that engaged 10 times faster than your current hub, weighed only 200 gms, and was indestructible, would you want it?